Maple syrup is a pantry staple in the United States. But more often than not the syrup in the average American pantry is pretty far from pure maple syrup. In fact, most leading brands of maple syrup in the U.S. use larger amounts of corn syrup, high-fructose corn syrup, water and sugar than they do actual maple syrup. Maple syrup is a product of the northeastern states, with Vermont producing just over half a million pounds of syrup annually. This, of course, pales in comparison to their neighbors to the north in Quebec, Canada, who produce over 6.5 million pounds of maple syrup each year. You see, maple syrup is big business, even if many of us are eating something else entirely on our morning waffles. Maple syrup’s origin story includes Native Americans, who were tapping maple trees and boiling the sap down to a syrup long before European settlers set foot on the shores of North America. One Native myth features Glooscap, a legendary figure for some Native tribes, who caught the people drinking syrup directly from maple trees instead of working. To stop them he added water to the syrup and made it available only in the spring so they would have to boil the sap instead of lazily drinking it. Another legend states that a Native woman ran out of water for a boiled meat dish she was preparing and tapped a maple tree for sap. While boiling it turned to the syrup we know and love today. No matter where maple syrup originated, we can all be thankful that the Native tribes took the time to teach others how to properly tap and boil sap into syrup. On this episode of Cooking with Fire, Josh Cary and Chef Tom Jackson make a maple-glazed pork tenderloin. Enjoy! Preheat your grill to 450ºF, set up with both direct and indirect cooking zones. Combine the maple syrup and Dijon and mix well. Apple a thin layer of the mixture to the surface of the tenderloin. Season the surface of the meat with smoked salt, black pepper, and thyme. 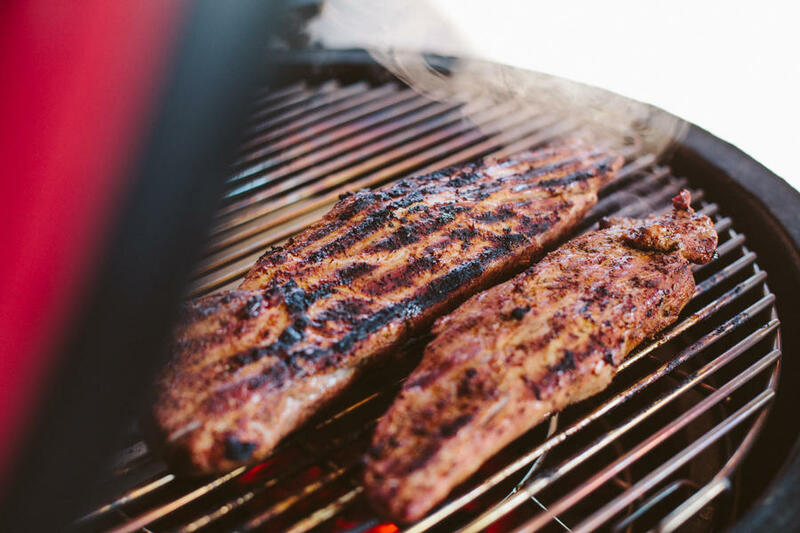 Grill the pork tenderloin over direct heat, turning until the sides are all slightly charred. While the pork is cooking, pour the remaining maple syrup and dijon combination into a small skillet and bring to a simmer. Reduce by half. Remove from the heat. When the pork has nice grill marks/char, move to the indirect side of the grill. Brush with the maple glaze and continue cooking until the internal temperature reaches 140ºF. Brush the pork every 5-10 minutes. Brush again with the glaze and remove from the grill. Rest 5 minutes before slicing.